O Mighty Lizard, what is thy command?! We are gathered here [Toys R Us, Times Sqaure], some one thousand of thy humble servants ready to do thy will. No, O Great One! Do not be displeased with us! We have read Your word; we have heard Your command [Whenever it roars, moan and cower behind outstretched hands]. We lift up our hands and offer You our praise and supplications. This one is going to be hard to beat. 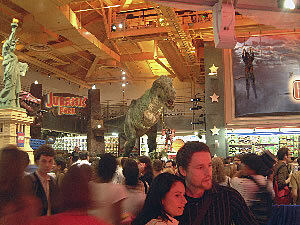 There may not have been 1,000 of us, but there were certainly more than 500 crowded into the Jurassic Park exhibit in the Toys R Us mega store on Times Square. The numbers were truly ‘uncountable’ given the nature of the space.